What do I do and where do I go? Always call your local Law Enforcement agency if you are in immediate danger. 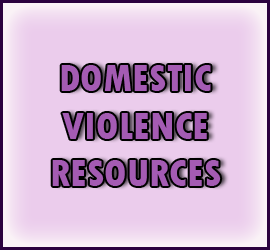 There are also shelters for victims of domestic violence. See resources on the right. After filling out the paperwork which has been given to you, you will be assisted in completing a petition for an injunction. If a judge decides you meet the statutory requirements for the injunction, the judge will issue a Temporary Injunction, valid for fifteen (15) days, before you leave today. A hearing will be set within fifteen (15) days, and at that hearing, the judge will decide whether to grant a Permanent Injunction. If a Permanent Injunction is granted, it will be good indefinitely or until dissolved by the Court. A sheriff will try to serve the respondent with a copy of the pertinent court documents. If the judge decides you do not meet the statutory requirements for the Temporary Injunction, you may still request a hearing where you and the respondent will appear before the judge. If the judge denies the Temporary Injunction because it does not appear that there is an immediate and present danger of domestic violence, a full hearing on the Petition for the Temporary Injunction will automatically be set on the soonest court date available. A sheriff will try to serve the respondent with a copy of the pertinent court document. However, you will not have the protection of an injunction during the time prior to the hearing. Violence means any assault, aggravated assault, battery, aggravated battery, sexual assault, sexual battery, stalking, aggravated stalking, or any criminal offense resulting in physical injury or death of one family or household member by another who is or was residing in the same single dwelling unit. Your relationship with the person whom the injunction is being filed against must be that of a spouse, an ex-spouse, a relative by blood or marriage, who lives or has lived with you in the same dwelling as a family unit, anyone who lives or has lived with you in the same dwelling as a family unit, or anyone with whom you have had a child, with or without having lived together.